It is crunch time! Just a few more weeks until the official #lastbell of the 2015-2016 année scolaire. How can I make the month of AVRIL really count? How can I make the most of the days between May 2 and the official exams when I won’t have everyone every day? What can we do that is meaningful AFTER those official exams so that we aren’t doing nothing for a week or two before the end of the school year? The AP French exam is L-O-N-G. It contains 6 different sections and assesses all the skills of knowing a language. The problem is that most of the sections take longer than 49 minutes to complete, so as much as we can practice in class, there’s no way to really simulate actual testing conditions. I can tell and tell and tell my students that testing fatigue is a real thing when it comes to this exam, but there’s nothing like working one all the way through to get them to believe me so they’ll come prepared with some serious mental fortitude (and SNACKS). I decided it would be best for my students if they could get a true feel for the test in its entirety and offered a practice test on a Saturday morning. Not for a grade. Not for bonus. Not for anything EXTRA other than practice and feedback. Out of 21 students between two high schools, I had 7 show up at 8 am for a four hour practice exam. That’s 1/3 of my AP students. These are kids who know what dedication is. These are students who are begging for their teachers to work until the last bell. These are kids who remind us that they DESERVE our best until the very end! These élèves are doing WORK on a Saturday morning! A little practice AP French exam- not a bad way to spend 4 hours on a beautiful Saturday morning! As for after the exam, we have plans to finish watching a film that is connected to one of the themes we studied this year. It’s called Les Intouchables. We only watched a clip of it a few weeks ago, but the kids have been BEGGING to finish it. It’s an engaging film, and I can’t wait to experience the rest of it with them. It will spark great conversation about handicap accessibility, class, race, family expectations, and friendship. EN FRANÇAIS bien sûr. 🙂 We also have plans to do our yearly art project- this year we will study le pointillisme. *Update! My students took the AP French exam yesterday, and although I know they felt overwhelmed (it would be sort of crazy if they didn’t), I did get some good feedback from students. There were a ton of vocab words from that quizlet and I used some in my writing so merci beaucoup for that. THANK YOU SO MUCH for such a great year. You taught all of us so much more than French. Thanks for your daily investment in us, I really appreciate it. My PLC looked at this goal and discussed how to apply this to our foreign language classes. We know we have to provide lots of different types of input in order for our students to get new information and give them opportunities to DO something with the information they’ve received. This week in my AP French class, I kept this in mind while designing a lesson about comparing and contrasting schools in France and the US. One of the sections on the AP French exam requires students to do an oral presentation comparing and contrasting a certain aspect of life in our community to a Francophone community. For this unit, it was important that we learn something new about a certain aspect (EDUCATION) from several sources and also focus on strategies to compare and contrast. Pourquoi le premier Septembre est un jour important en France? As they were answering that question, they also discussed the dates of vacations. I heard them saying things like “Whoa, a 2 week break in February would be awesome!” I could tell they were obtaining and evaluating information. Then as a class we discussed the similarities and differences in our school calendars, the nomenclature of our breaks (this map calls the break in December “Christmas Vacation”), the fact that all schools in France start and end on the same day, etc. The students then watched this video from 1jour1actu.com. It talks about how education is obligatory and secular in France, among other topics. In the lower levels, we haven’t done a lot of practice on writing comparisons and contrasts, so I knew we weren’t ready to really DO anything yet with the new information we learned from the graph and the video. Luckily, I found this blog written by American college students who studied abroad in France. One of their posts compares and contrasts 3 aspects of life in France to the US: food, transportation, and family. We read the blog post together and looked at how the writers introduced each topic, added images, and used certain terminology when introducing their ideas. Example blog we used to study how to compare/contrast. Using the blog as a sort of template, the students then were grouped together to write a blog post together that compared and contrasted education in the US and France. They wrote their first drafts using a shared Google Doc, and then Natalie, one of my students, actually created a new blog called Selon Nous which means “According to Us.” (Last year she had a fictional blog called Selon Moi- so great to see it realized!!). After a revision and some help from me, the students all uploaded their posts (even my students from SPHS!) onto the class blog, or in other words, they communicated information. Our class blog created by Natalie! Stay tuned to Selon Nous for more posts by my awesome AP students! This morning I had to drive my husband to work, and I thought it was going to totally throw off my plans. Usually I arrive at school at least an hour before the first bell because I do my best thinking in the morning. Usually! Today I was reminded that a little spontaneity and the willingness to change plans can make for a very very good class. I’ve been giving my students little 3-5 question homeworks lately just to keep them engaged a bit at home. Last night I assigned them this picture (which I found from the Google Drive folder posted on the Facebook page called French Teachers in the US– you should request to join it because those people are AMAZING- that’s a whole other post). Anyway, I assigned them this picture and asked them easy questions (in French). What do you think this picture is? What clues lead you to that conclusion? List 3 french words you know. Define 1 word you don’t know. And that was it- that was all I was going to do with it. I wanted them to interpret some realia. But then I got to school later than usual and had to come up with something on the fly. How can I extend this into today?!?! So I went to YouTube and found this video of 3 friends playing the game as they explain the rules. As the students watched, I asked them to write down any words they understood. (So far, each level has done a better job at this! phew!) Then we discussed the words they understood and talked about how although they didn’t know exactly which words were always said, they all understood that it was a video of friends playing and explaining a game. 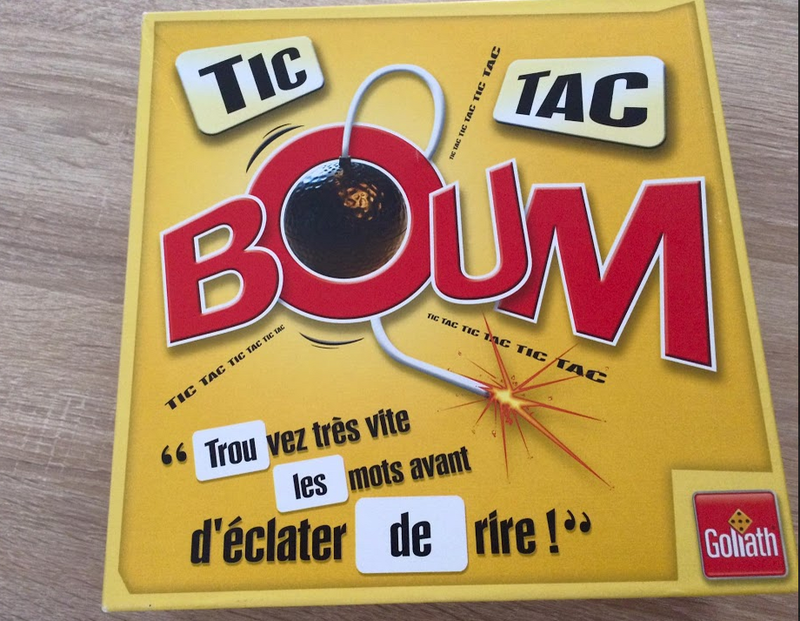 I also had them guess what they thought the rules were and what TIC TAC and BOUM mean. Then we looked at a written explanation of the rules and compared them to what they understood from watching the video. They were all very very close!! Qu’est-ce que ça veut dire “la manche”? Quelle est la règle avec le son et l’orthographe? It took them a few minutes to figure out, but they used the context of the rules to come up with the right answer. Next, the students got online and found French board games and shared links (we use Google Classroom) to the rules and to videos of advertisements or of people playing them. The kids really wanted to try playing, but of course I don’t actually HAVE this game, and I only just learned the rules this morning! So I decided to have the groups “play” after they got done posting their comments. They were to come up with 2-3 words that contain different sounds which I wrote on the board. For example: si, pos, cro, poss, yé, mai, mat, tou. It was great seeing them working together and coming up with words! AND THEN THE BELL RANG! And I was glad it was such a good day of learning!! Like many foreign language teachers, I’m teaching many levels this year. Luckily, I have teachers around me who are open and willing to share, whether it be other languages teachers at my school or the other high school in the district! Here’s some classroom activities that I’ve done or plan to do that I have shared with my colleagues or they’ve shared with me. Please feel free to make a copy to your Google Drives and use with your classrooms! Oui ou Non : One of my classes is full of very very sharp kids who get through activities quicker than I anticipate. I could tell they were rocking and rolling and would finish way before I expected! So I created this Google Slides presentation to reinforce many of the same summer activities from the previous post. For this activity, the students would stand on the left or the right side of the room depending on if they had done the activity. They couldn’t bring their sheets with them this time! It was good to get them up and moving around some, and it was a very visual way to get to know more students in the class than just those in your group. I could also ask more questions to students who had done the activity- like which beach? who got married? etc. (In French of course.) The video games slide was especially telling because they found out that some students who they didn’t expect played the same video game as them! 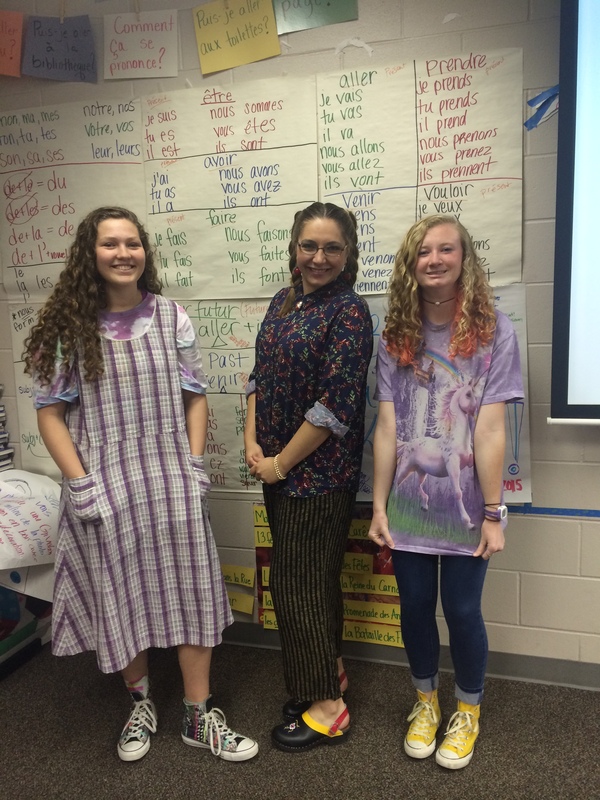 IB Learner Profile Activity (French) : Senora Moore and I both teach IB Language B, so we work together a lot- our languages may be different, but our content themes and the assessments are the same. 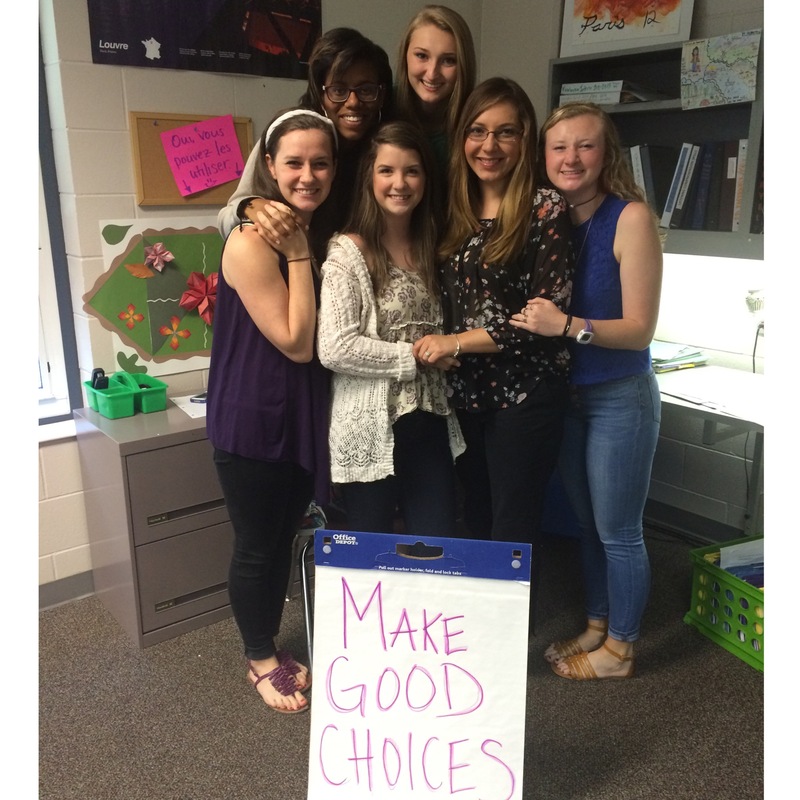 We like to teach the IB Learner Profile to our classes, and each year we do it a bit differently. (Last year the students watched a video then we discussed the attributes of the people in the video in the context of the learner profile. The video was really good, but we could have done a better job with the actual attributes). This year, all of our students have Chromebooks, so Senora Moore came up with a great activity to have the kids learn about the IB Learner Profile by creating a class Google Slides presentation in the language explaining the attributes. Each group will define in their own words the attribute, find synonyms for the word, explain how we can demonstrate that attribute in language class, and find an image that represents it. Then the students will present their attributes to the class. The presentation ends with discussion questions where students evaluate which attributes they feel they demonstrate, and which ones are difficult for them. (Spanish Version) For homework, I am asking my students to write down which ones they demonstrate and how as well as which ones are difficult and why they feel that way. We may continue the discussion the next day. Now I’m working on something similar for my AP class which I can share with the AP Spanish teacher. Happy sharing! Happy back to school! 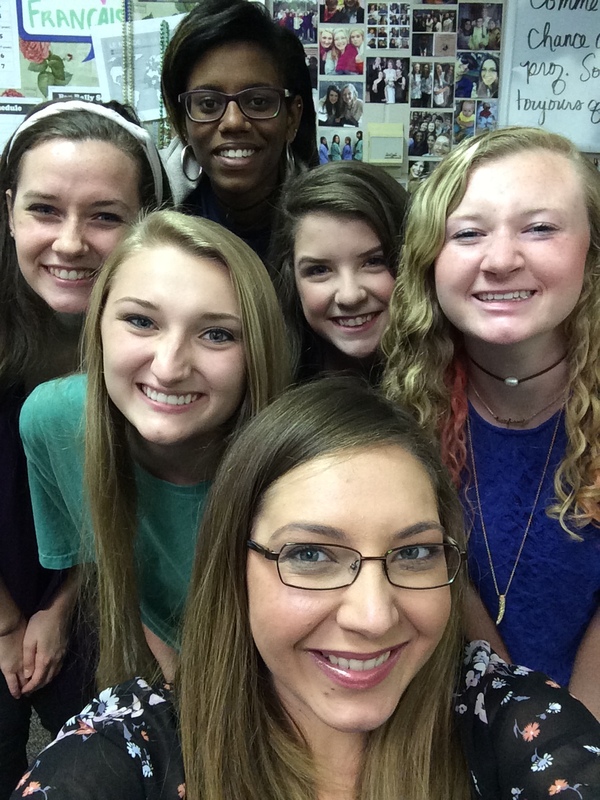 This group of girls have been with my since my very first day at Hoover High School. They were all just freshman students in French 1. 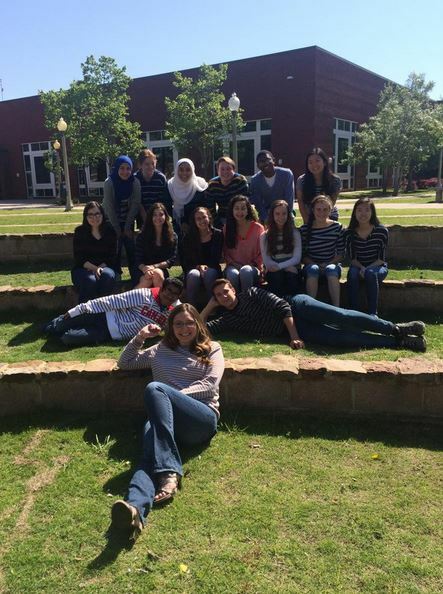 Most of them were planning to only take two years of French, but luckily for me, they all stayed and did 4! I’m proud of how much they’ve learned and how much they’ve matured. It’s been my honor and pleasure to teach them and get to know them. They truly are a special bunch!!! !